Nexus One owners, the surprisingly long wait is (almost) over: today Google has begun pushing out the latest version of Android, codenamed Gingerbread, to Nexus One devices. The rollout will likely take a few days, but you should be expecting an Over The Air update very soon. And there’s more good news: Nexus S owners are getting an OTA update as well, which includes fixes for some annoying bugs (including a random reboot issue) and additional support for Near Field Communication. The update for Nexus S owners also includes a big change to the way Facebook syncing works (in short, it doesn’t) — see this post for more on this aggressive move by Google. The improvements to NFC for the Nexus S are especially interesting because they give a taste of Google’s future plans for the technology. 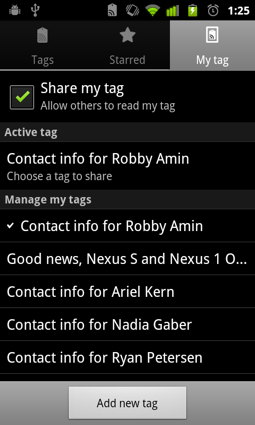 The new functionality is best demonstrated by additions to the Tags application, which ships on the Nexus S.
Until now Tags has allowed users to tap their phone on NFC tags at various venues to read information off of them (unfortunately these aren’t very commonplace yet — I have yet to actually use the feature in a real-world situation). But this update also adds write support — you can now create your own tag on the phone, and specify what information you want to share, be it your contact information, a link to a website, or a snippet of text. Then, when someone else with an NFC-equipped device taps your phone with theirs, they’ll be able to immediately receive this information (much in the same way you would using Bump). And, if you happen to own any of those NFC stickers that Google likes to show off, you can use the phone to write data to those, too. At this point the feature is going to be more of a novelty than anything, but it’s likely that the next iPhone will support NFC, and it won’t be long before we start using it for payments and third-party applications take advantage of it, too.